MISSES’ ROBE WITH TIE BELT, TUNIC, TOP, PANTS AND SHORTS: Very loose fitting robe has shawl collar and sleeve facing turned back to form cuffs; very loose fitting tunic with long or short sleeves or top has extended shoulders; pull-on pants or shorts, without side seams, have fold-back waistline casing with self fabric drawstring. 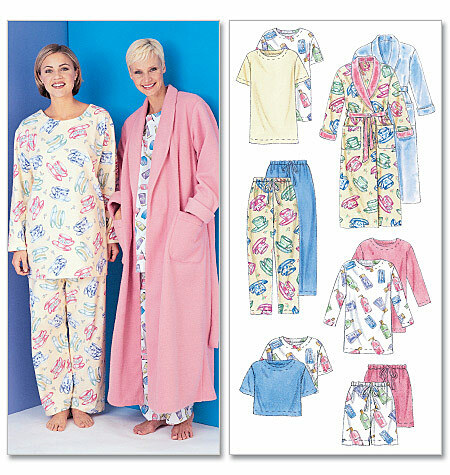 SUGGESTED FABRICS: Robe A, B, Tunic, Top, Pants, Shorts – Cotton • Cotton Blends • Cotton Flannel • Satin • Lightweight Chambray • Oxford Cloth • Seersucker • Challis • Batiste; Robe A, B – also Terry Cloth • Velour. ***With or Without Nap – Additional Fabric may be needed to match stripes or plaids. Bust 291/2 301/2 311/2 321/2 34 36 38 40 42 44 Ins. 45″ *** 47/8 51/4 53/8 53/8 51/2 Yds. Interfacing – 21″ thru 25″, 21/8 yds. 45″ *** 45/8 43/4 43/4 47/8 47/8 Yds. 45″ *** 25/8 25/8 25/8 23/4 3 Yds. Interfacing – 21″ thru 25″, 3/8 yd. 45″ *** 21/4 23/8 23/8 21/2 25/8 Yds. 45″ *** 11/2 11/2 11/2 15/8 17/8 Yds. 45″ thru 60″ *** 21/2 21/2 21/2 25/8 25/8 Yds. Shorts – 45″ thru 60″ *** 11/4 11/4 11/4 13/8 13/8 Yds. Robe A, B 54 541/2 55 551/2 56 Ins.